See my Westie rescue site below, where there is a link. And, know that there are fatwas out there against "decorative dogs". All God created is good and all Creation is from God. The great St. Philip Neri had a little dog, St. Thomas More had a monkey and St. Benedict had a pet crow. 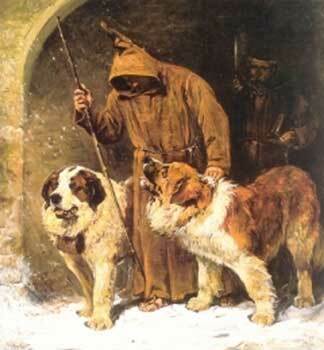 There is a breed named after my favorite saint, Bernard. I am sure readers can add to the list of saints with pets. 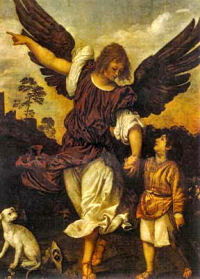 And, did not St. Raphael accompany Tobias with a dog? My religion, the Catholic Faith, likes dogs and we know that God likes dogs--really! An Iranian cleric Ayatollah Lotfollah Safi Golpaygani issued a fatwa against "buying, selling and keeping decorative dogs," the Jomhouri Eslami newspaper reported. 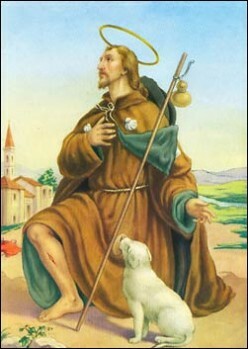 St. Raphael, pray for us.....and for all pet lovers. 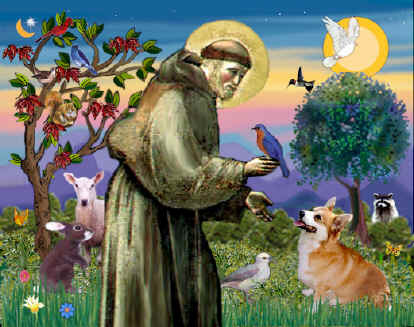 I life the Corgi in this painting of St. Francis, patron of animals. And, just a note to Father Z, there is a squirrel in this picture....Ah, Catholics also have a sense of humor. If I were a male person, which I am not, I could think of no better job, for honor and for fun, than being the Pope's MC. 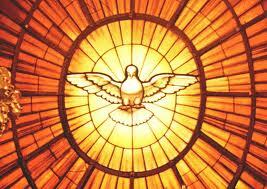 This past week in The Catholic Herald, there was an interview of Msgr. Guido Marini, who has a famous cat named after him as well. Msgr. Marini is responsible for implementing the more traditional changes in the Liturgy we have seen since his appointment in 2005. The two priests, the Pope and this MC are experts in the Liturgy and aware that a Papal Liturgy should look and feel differently. One of the most succinct statements in the interview reads, "Pope Benedict ensures that the liturgical celebrations are 'always an example and reference point for the universal Church.'" Yes and thank you. 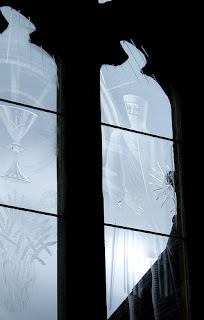 Marini was quoted, again referring to the Pope, regarding the message at the recent Eucharistic Congress, that "much still remains to be done on the path of real liturgical renewal." One could start with the closing Mass of the Congress. 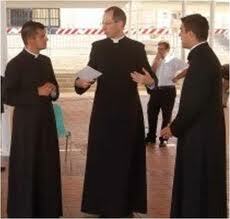 Just taking one point, the Pope requires those who receive Holy Communion from his to kneel. I do this daily, when my right knee does not hurt. 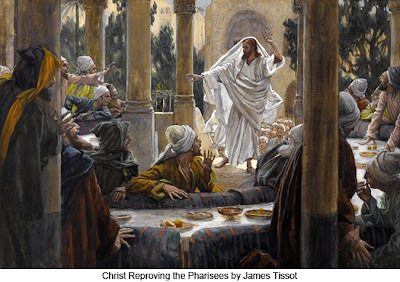 Thankfully, the priests from whom I receive Holy Communion do not mind, but know what the Pope is doing as well--setting the tone of more respect. Calling this and other changes, "exemplary gestures" is enough for me. On large outdoor Masses, which I am totally against, having been involved in such as a younger person at the level of organization and help, and realizing all the pitfalls, Marini notes that these bring out problems as the journalist writes. Read the entire article in the paper, June 29th Edition. Many rhetorical forms are passing because of the demise of writing. But, in addition to the lack of interest or love of grammar and prose, for me, the loss of language, especially satirical language has to do with political correctness. Political correctness forbids social criticism. Social criticism is based on standards, on rules, on a hierarchy of values and behaviors. Without a hierarchy of values, there can be no opinions, no objectivity. The entire society, now based on subjectivism, reels from reality and falls into a nicety of feelings which cries out "No one can be hurt. No one can be criticized." 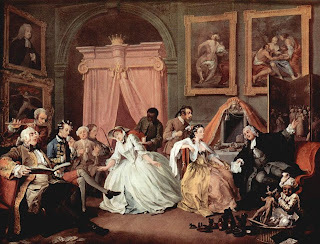 In the days of Hogarth, society could be criticized for many sins, but now, sin is denied and psychology has allowed us all to make excuses for bad behavior. 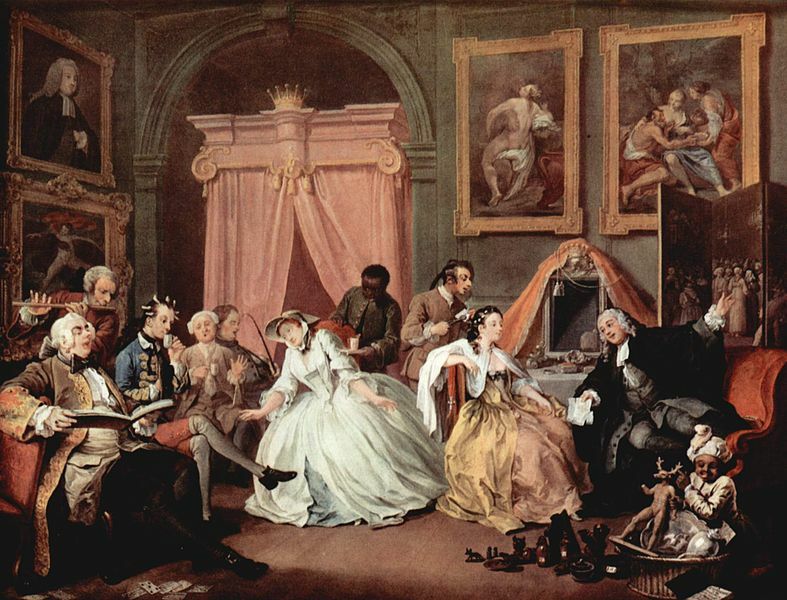 Hogarth's prints, the three famous series which I have seen, especially the Marriage a-la-mode series, point out graphically the foibles of consumerism and material occupations. 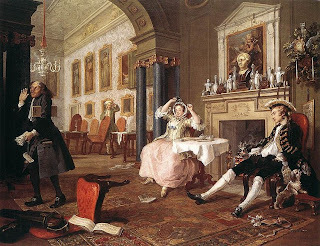 Hogarth's keen use of symbolism and literature, as well as myth and the evils of sin create strong parables, as well as a record of life at a certain time in Britain-a record of vice. Would Hogarth be allowed to publish, sell, become famous for his satires today? Mark Twain is another satirist, whose quick wit shed light as a commentary on American and European society. We have lost this art, because we can no longer be objective. We are not allowed to be objective, but can only wallow in the relativism of feelings, emotions and subjectivity. I shall give a modern day example. I have been observing the manners or lack of manners among men of many nations and backgrounds in London. Now, when I write some of my observations, I shall expect an outcry of "That's not fair", or "You can't judge", or "What about their background, psychological state, feelings. etc., etc., etc." Recently, I have been comparing national differences, which some people claim do not exist, but do. Being in London, I am surrounded by people from all over the world. I have been observing men, women, and children when I am out and about. I have noticed that the manners of men have almost completely disappeared except among certain groupings. Why this has occurred, I do not know, but there is a huge difference in gentlemanly behavior among men. A few days ago, I posted Blessed John Henry Cardinal Newman's definition of a gentlemen. Now, some nationalities do not, apparently, believe in gentlemanly behavior. Rudeness is considered masculine, I guess. Too bad. "Gangsta" is in among some groupings. Wow, what would Twain do with "gangsta" talk? 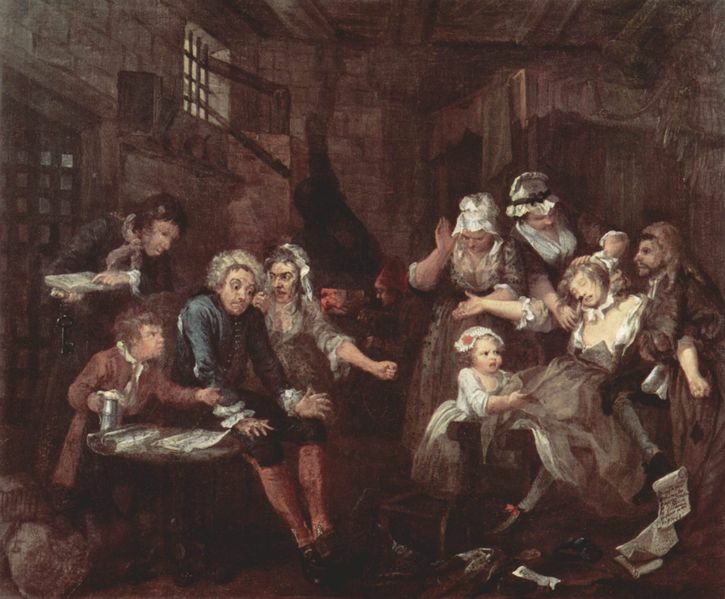 Hogarth would have an entirely new set of subjects for his art and Mark Twain would have material for his witty essays. Would that we had such satirists now. My criteria for satire involves the following criteria, which is not political correct: does the man move out of my way on the sidewalk, or charge towards me wanting me to move over? Do I have to walk into the street to let a man pass, who refuses to move over? If I am bumped into, does he say sorry? Does he open a door for me or offer me a seat on the bus or train? Does he crash through a line to get in front of me instead of queuing? Does he help me with packages or luggage? Does he say thank you and you are welcome? Does he ask how am I today if we speak to each other? If there are no empty seats in Church, does he get up for me to sit down? If I accidentally drop my umbrella, does he pick it up? If I accidentally bump into a man, does he say sorry or swear, or sound like he is swearing at me? All these things have happened at least once and, indeed more than once. I cannot draw like Hogarth. My wit is not as sharp as Twain's. Now, my sampling is not scientific, but merely watching and living in London for over three weeks. But, one does not need time if one has the eye of a satirist. Here are my results. Those who are politically correct may stop reading at this point. Men from England, Germany, and India of a certain age are the most polite. They also dress better than younger men. By a certain age, I mean 60-ish or over. Very young men from the Orient are polite, such as men from Singapore or Japan. They get gold stars for politeness. Some British young men on the tube are very polite. Hogarth could do some prints of nice young men offering older ladies seats during rush hour on the Central Line. Middle-aged men who are the most polite are the Germans and the Americans. I do not know why the differences. Maybe they are just happier people in general and therefore can be polite. Notice that the British and Germans are on two lists. Mark Twain would be using dialect for these commentaries. But, no. We are not allowed to be critical, to hurt feelings, to point out bad behavior, even sin....sigh. We have lost the art of satire. Society is going to hell in a hand-basket because we must be so nice, so sincere, so superficial. True to my God, a fragrance in the path I trod." By the way, Christ was not politically correct.